Bag palletizers receive bags from a transfer conveyor and can stack up to 25 bags/min. on a pallet. Depending on the system a bag palletizer may include: a bag flatting conveyor, a bag accumulation station, a bag positioning conveyor, a layering conveyor, a robotic bag loader, an empty pallet dispenser, a filled pallet dispenser and a pallet check-weigher. Semi-automated bag palletizers require an operator while fully automated bag palletizers have a robotic stacker. For more specific features click on one of the products below. Alternatively, contact us to receive more information about our product line or fill out our Packaging Solutions Worksheet to inform us of you specific needs. 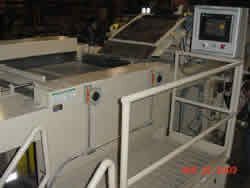 Our packaging systems experts will then find the right equipment for you.